This is a case report of a 47-year-old male patient , a diabetic who presented with gradual loss of vision in both eyes. He had a combination of central serous retinopathy with diabetic retinopathy. Retinal laser was not possible due to exudative retinal detachment posing a therapeutic dilemma. 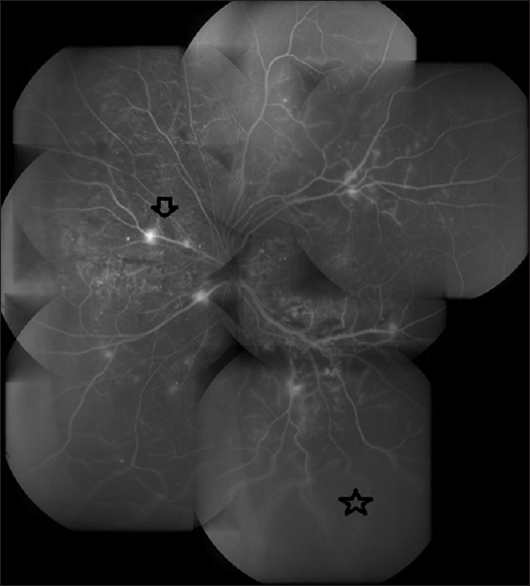 A 47-year-old gentleman presented with gradual dimness of vision in his both eyes. He was known diabetic on insulin. He had been fighting a legal battle in the court of law for job-related issues for the past 6 years. The best-corrected visual acuity in the right and left eye were 20/80 and 20/60, respectively. Anterior segment was unremarkable in both eyes. The right eye had retinal pigment epithelial atrophy at macula and few retinal hemorrhages near superior vascular arcade [Figure 1]. The left eye had retinal pigment epithelial atrophy with retinal hemorrhages and hard exudates at macula [Figure 1]. Inferior fundus in both eyes revealed nonrhegmatogenous exudative retinal detachment reaching up to inferior vascular arcade [Figure 2] and [Figure 3]. Fundus fluorescein angiogram of the right eye revealed large window defect at the covering the macula with leakage of dye near superior arcade [Figure 2]. It also showed well-circumscribed area of intense hyperfluorescence in temporal periphery suggestive of retinal pigment epithelial rip [Figure 2]. The left eye had retinal neovascularizations and had microaneurysms at posterior pole [Figure 3]. In view of the history of undue mental stress combined with exudative retinal detachment in both eyes and large window defect in right eye along with retinal pigment epithelial rip; the patient was diagnosed to have central serous retinopathy. He also had nonproliferative diabetic retinopathy in the right eye and proliferative diabetic retinopathy in the left eye. Persons having undue mental stress are predisposed to develop central serous retinopathy. Our patient had a combination of central serous retinopathy with diabetic retinopathy posing a therapeutic dilemma. Retinal laser was not possible due to exudative retinal detachment. The patient was advised to avoid undue mental stress. He was advised to review back after 2 weeks for the reassessment of his eyes; however, he did not turn up for review as yet. 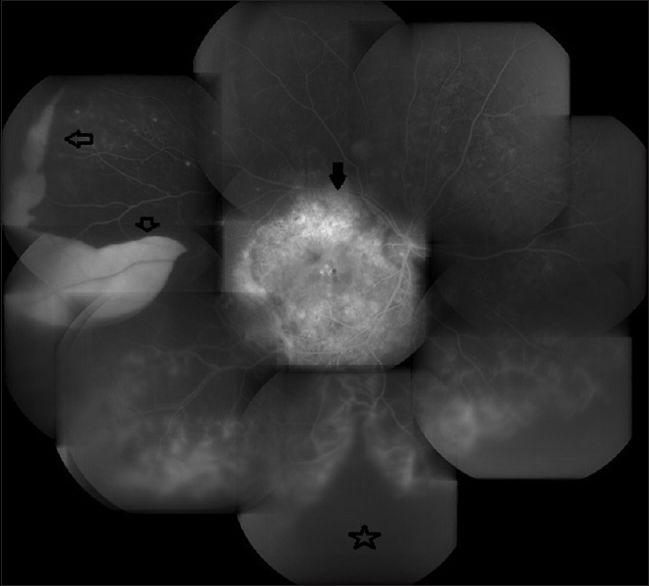 Nicholson B, Noble J, Forooghian F, Meyerle C. Central serous chorioretinopathy: Update on pathophysiology and treatment. Surv Ophthalmol 2013;58:103-26.